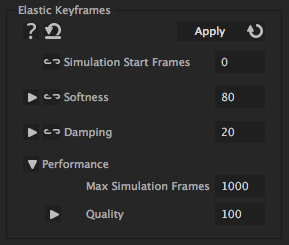 With this iExpression you can connect a property to its own keyframes in an elastic way, as if the property would be connected to its keyframes by a rubber band. This is like the Elastic Connection iExpressions, except that the expression does not follow another property, but its own keyframes. The iExpression can be applied to 1D,2D or 3D properties and even colors.